This option is for a fully automatic line, as the machine folds the bag from a film roll, fills the bag with product and seals it and cuts it. 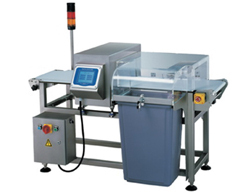 This option works with premade bags, where the operator is required to place the bag on the specified location and to send a signal for the machine to start the filling. Note: The option 1 equipment has 2 modes of working - automatic (when working with bags up to 10L) and semi automatic (when working with bags >10L). In other words, the machine works as a filling machine when working with bags >10. Note: The configuration to the right is just an example, as the client can purchase only the modules he requires. Measures out a product from bulk by some preset value and sends the ready dosage to the packaging machine (p.1). Prints a date, lot and batch numbers, barcode and other obligatory information on the blank field of the package. Forms, fills and seals elastic packages. For packaging material is used thermo sealable film in the form of a roll, which by passing through the different processes of folding, sealing, filling and cutting, forms the ready bag. Protects the warm seals of the package from damage when falling on the ground and transports the ready package to the stacking table. 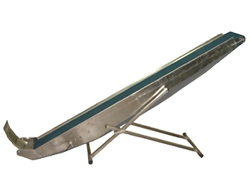 Transports the product to the dosing device's hopper (p.2) and maintains a constant level of the product. Printing date, LOT or batch number, barcode and every other obligatory information on the blank field of the package. Protects the warm seals of the package from damage, when falling on the ground. It transports the package to the table for stacking. It collects and distributes the ready packages. Prevents the stacking of packages and protects their good appearance. Recheck the ready packages, which come from the packaging machine and puts aside those that do not meet the set target weight. 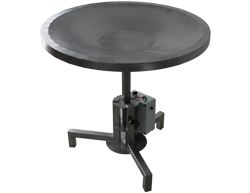 Scans and inspects for the presence of metal particles inside the ready packages and puts aside the faulty production. Allows for working with films with different size. 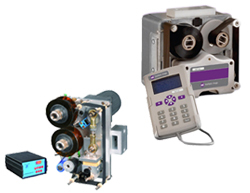 The devices are produced according to the customer's requirements. 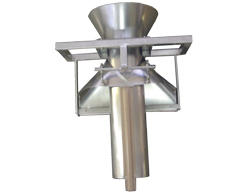 This option for filling and packing of soil mixtures works with premade bags. 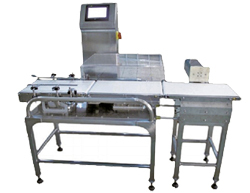 The machine consists of two parts - filling unit (dosing device) and conveyor for maintaining a constant product level in the filler's hopper. The filler is volumetric, rotary type. The single cup's volume is designed up to the customer's request. Working with the machine is quite easy - the operator should just put the premade empty bag on the specified the place and send a start signal (via button or pedal) in order to start the filling. The filled bags are closed with manual sealing devices. Note: for more information, please contact us. Fills the product to the empty bag. The single cup's volume is designed according to the customer's needs. The operator sets the number of filling cups, which to be discharged into the empty bag. 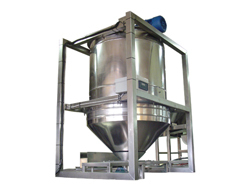 Transports the product to the filler's hopper (p.1) and maintains a constant level of the product.